The following is the Boxing Insider notebook for the week of March 20th to March 27th covering the comings and goings in the sport of boxing that you might have missed. Undefeated heavyweight world champions Anthony Joshua and Joseph Parker kicked off fight week with a tense faceoff at the sprawling Sky Headquarters outside London as they approach Saturday’s Heavyweight World Championship Unification live on SHOWTIME from Principality Stadium in Cardiff, Wales. The British sensation Joshua (20-0, 20 KOs) owns the IBF and WBA titles, while New Zealand’s Parker (24-0, 18 KOs) is the reigning WBO Champion. The two will meet on Saturday in just the 11th unification in heavyweight history in front of what is expected to be nearly 80,000 boxing fans at the national stadium of Wales. The blockbuster matchup marks just the second heavyweight championship unification between undefeated world titleholders. The last fighter to emerge victorious from a matchup of unbeaten heavyweight champions was Mike Tyson in 1987. Here’s what the fighters had to say at Tuesday’s press conference. “I feel like this is what we have to do. If champions don’t face off, then we won’t bring excitement to boxing, and I feel like we heavyweights are the flagbearers for the sport. “I’m peaking, but what I need to do is remain where I am. If you want to see my peak then I need to face stern challenges. The better opponent, the better I get. “We embrace the challenge of facing an undefeated champion. He’s a champion, he’s done well for himself. He’s quick and he can take a punch. “For a long time, I’ve had to rely on my strength and my physicality. Over the 10 years I’ve been boxing, I’ve built a lot of mental strength as well. And now I’m combining the two. I feel confident and I’m looking forward to the challenge. “I take it one thousand percent one fight at a time. A lot of talk has been happening about AJ vs. Deontay (Wilder). People need to be realistic. I’m looking at Joseph Parker, who is a lively challenger. He’s a champion for a reason. “Let’s say we look into a crystal ball and I’m victorious, then we can start talking about future plans. But, for now, my future starts on Saturday. That’s where I’ve got to look to and not really beyond that moment. “There’s definitely a fear of losing because it keeps me going. I have to make sure I stay focused on the task at hand. The fear of losing keeps me motivated because I know how quickly the tables can turn. One minute you’re the man and the next you’re not. “I feel ready, confident and sharp. I feel better than ever, and I’m taking these belts back to New Zealand. “I see Joshua as a great champion. The reason why we wanted this fight is because we respect what he’s achieved in the boxing world. We respect his team and what they’ve been able to achieve on this side of the world. And we love challenges. We see him as a big challenge and that’s the reason we want to fight him. “I feel it’s my time. I’m young, I’m fast, I’m strong. And I’m determined to win. I’m not here for a payday. I’m here to take those belts back with me. I’m here to be part of history. I’m not doing it just for myself. I’m doing it for my team, my family and my country. “He’s at his best. I’m at my best. This is the perfect time for the fight. There are going to be no excuses. Whoever wins is the best on the day. “I’m going to beat Joshua. I haven’t decided how I want to beat him yet. I don’t know if it’s a knockout or if it’s points or decision. We’ll see how I feel on fight night. But I’m going to be undefeated going home with the belts. These are mine. “I’m in the best shape ever. Whoever wins is the better man. There’s no excuses on my side. I’m feeling great, I’m feeling strong and I’m going to leave it all in the ring. I’m punching hard, I’m punching with way more speed so I’m looking to put on a display. “This is the perfect time because he’s undefeated. He’s got belts that I want. We’re both at the top of our game now and it’s a good time to see who the best is. Andrade, who is ranked number #1 by the WBO in the middleweight division, feels that if Alvarez is not cleared by the commission for his recent positive test for Clenbuterol, he would be the most obvious candidate to face Golovkin. “I am ready, willing, and able to step to the plate on May 5th to fight Golovkin,” stated Andrade. “I am always in the gym, and I will start VADA testing right now. I guarantee that I will pass all the tests. I know other fighters can’t say the same thing. I am undefeated, and a two-time world champion. This Friday night, welterweight contender, Raymond “Tito” Serrano will look for his 4th consecutive victory when he takes on undefeated prospect Malik Hawkins in the 10-round main event at The Fillmore in Serrano’s hometown of Philadelphia. 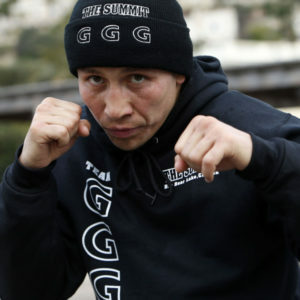 Serrano whose winning streak has coincided with his changing of training venues to Los Angeles, has defeated three fighters in a row that sport a combined record of 25-4. In his last outing, the 28 year-old Serrano was impressive in defeating previously undefeated Enver Halili via 8th round disqualification. Another big part of his resurgence is his manager Mark Cipparone of Club 1957 Management. Cipparone has helped put Serrano in the best possible situation for Serrano to succeed, and Serrano fully acknowledges that. In Hawkins, Serrano is facing an undefeated but untested foe, and he feels with his confidence at a sky high level and ring experience will prove to be the difference. Cipparone has been seeing the steady improvement in the 11 year-veteran Serrano. “His last four fights have developed him further then he has at any point in his career. I would even say beginning with his fight against (Undefeated Prospect) Alex Saucedo. Raymond would have won the fight if he didn’t get caught in the 2nd round. Look at the scores. I think that fight was a turning point for him. It gave him the confidence that he could compete on the level of the top of the division,” said Cipparone, who also manages heavyweight Joey Dawejko. Francisco “El Bandido” Vargas (24-1-2, 17 KOs), two-time Fight of the Year winner and former WBC Super Featherweight World Champion, hosted a Los Angeles media workout on Tuesday, March 27 at Westside Boxing Club ahead of his battle against “Lightning” Rod Salka (24-4, 4 KOs) in a 10-round super featherweight fight in the main event of the April 12 edition of Golden Boy Boxing on ESPN at Fantasy Springs Resort Casino in Indio, Calif. ESPN2 and ESPN Deportes will air the fights beginning at 10:00 p.m. ET/7:00 p.m. PT, and stream live on ESPN3 starting at 8:30 p.m. ET/5:30 p.m. PT. Fighters from the explosive Vargas vs. Salka undercard also participated in today’s workout. San Diego’s Genaro “El Conde” Gamez (7-0, 5 KOs) will go up against Filipino boxer Recky “The Terror” Dulay (10-3, 7 KOs) in a scheduled 8-round lightweight fight. Aaron “Silencer” McKenna (2-0, 1 KO) will return against a soon-to-be-announced opponent in a four-round welterweight fight. Opening up the card is Rancho Mirage’s Javier Padilla (5-0-1, 5 KOs), who will fight in a scheduled six-round super bantamweight affair against Mexico City’s Ricardo Arias (1-2-1).